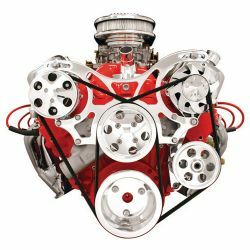 Complete packages include a polished billet aluminum crankshaft pulley, power steering pulley, alternator fan and pulley, water pump and tensioner pulleys, polished billet aluminum tensioner, polished aluminum bridge bracket, Edelbrock reverse rotation water pump, (optional) polished Sanden SD-7 compressor, polished aluminum compressor cover and manifold, (optional) Maval power steering pump with AN fittings, Powermaster 105 amp 1-wire alternator, ARP polished stainless fasteners, and Goodyear Gatorback Poly Serpentine or V-Groove belt. Please allow four weeks for chrome plating on a drive. Add on reservoirs are Billet Specialties part number 77910 for the remote reservoir, and 77930 for the clip on reservoir.